On the 20th day of the operation, Indian Navy personnel resumed diving using unmanned remotely-operated vehicles. 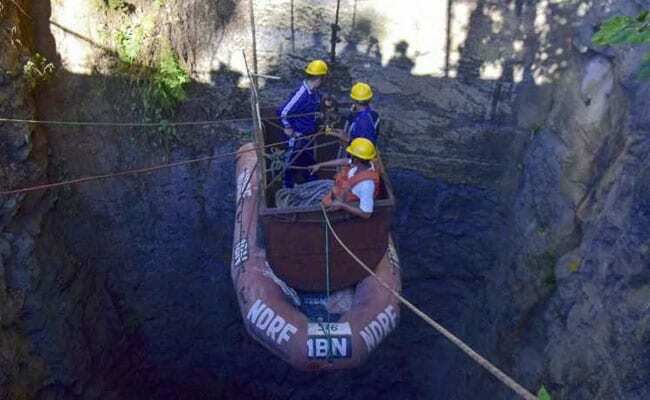 Operations to rescue miners trapped in a flooded quarry in Meghalaya's East Jaintia Hills district were hindered after high-powered pumps developed technical snags today, officials said. A total of 15 miners are trapped inside a 370-foot-deep illegal coal mine since December 13 after water from a nearby river poured in, puncturing the mine wall. On the 20th day of the operation, Indian Navy personnel resumed diving using unmanned remotely-operated vehicles with assistance from the NRDF in the main shaft, operation spokesperson R Susngi said. "There were some technical problems with the machines and the rescue operation was affected," he said. The depth of the shaft is a little over 370 foot (113 metre), Mr Susngi said quoting the Navy, and added that the water level inside the vertical shaft is at 161 foot (49 metre). He said work is on to get the pumps ready. The fire services team from Odisha is also preparing to resume pumping from the two shafts nearby. Mr Susngi said there was slight dip in the water level in the mine shaft, but it was not significant. The district administration is procuring a third crane which will be used in the abandoned mine shafts.